A giant wind turbine in Mullavilly, County Armagh - which operated 24/7 – is now in use during working hours only, following a Court Order served after an appeal against a Noise Abatement Notice was dismissed. An out of Court settlement was agreed between village based company Rapid International and Armagh, Banbridge and Craigavon Council. 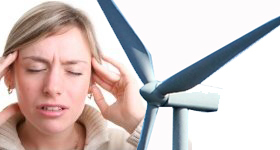 The Noise Abatement Notice – dating back to October 2014 – was issued after residents living close by complained that the turbine was creating what they termed “unacceptable noise “. With noise measurements conducted over several years the Council confirmed that there was too much noise. The Council and Rapid International agreed that the turbine should operate from 8am – 5pm only and, in addition, should be stopped during Bank and Public Holidays, five working days at Easter, a fortnight during the traditional July summer holiday and over Christmas and the New Year. Neither the residents nor the Company are happy with this outcome. Residents have had to listen to this noise for over five years night and day which caused sleep deprivation, stress, anxiety and forced residents to move away to sleep so that they could focus on their jobs. They have been unable to enjoy family meals, socialise with friends and family, and at times cannot open windows comfortably during the day. Rapid International say they made the agreement in order to draw a line under the issue –“we have more than complied, with the turbine now operating from 8.30am – 4.30pm during working days”.